TopTier is the global leader in concurrent stretch wrapping technology. Concurrent wrapping saves floor space and lowers overall end-of-line costs. 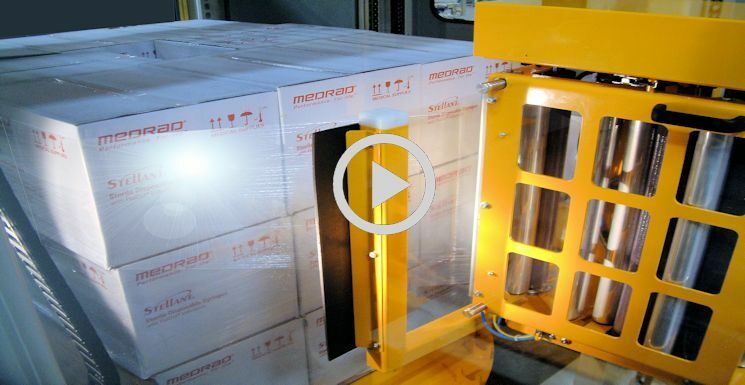 New patented features save film and insure continuous palletizing operations. Concurrent stretch wrapping is a cost effective and space saving alternative to stand-alone wrappers. TopTier’s concurrent stretch wrapping is optimized for palletizing and wrapping loads as the load is built. With concurrent wrapping, loads are stabilized during the palletizing process. Unstable loads that typically required tie sheets for stability can be built without sheets, thereby reducing consumables. Even stable interlocked loads can sometimes be difficult to move prior to wrapping. With concurrent wrapping, loads of any type are ready to go directly from palletizer to truck. The concurrent wrapper resides within the standard palletizer footprint. No additional floor space is required. Concurrent wrapping would not be acceptable if wrapping issues impacted palletizing operations. TopTier’s stretch wrapping technology provides reliable wrapping with no impact on palletizing throughput. Should the film brake during load build and wrap operations, recovery is automatic. The wrapper will overwrap the area where the break occurred, assuring proper load retention, and without operator intervention. Empty film rolls are replaced in less than 30 seconds. Simply open the wrapper door, remove the empty roll, and replace with a new roll, pulling a length of film through the pre-stretch section and close the wrapper door. Upon palletizer re-start, the film will automatically attach to the load and concurrent wrapping will continue. Proprietary automatic film brake recovery, automatic film start, and higher pre-stretch levels are predicated on advanced film management technology developed by TopTier. The rate of film dispensing is accurately controlled utilizing precise load cell feedback in combination with proprietary algorithms to assure load containment. 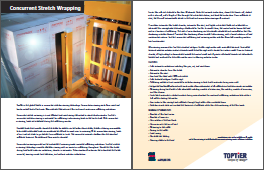 Trouble free wrapping results across a broad spectrum of load containment options. TopTier’s concurrent palletizing and wrapping system uses less film while providing superior load containment. All wrapping occurs within TopTier’s standard category 3 safety cage system with controlled entrance. Controlled entrance prevents operator access to hazards inside the safety cage until a request for access is made. Upon an entrance request, all high voltage is disconnected outside the control panel and all gravity influenced hazards are redundantly latched and confirmed by the safety system prior to allowing operator access. Non-concurrent wrapping is available should wrapping time requirements impact palletizer capabilities. Limitation is 40 loads an hour based on 60” load height. Some features may not be available on all models. End-of-line wrapping is available should concurrent wrapping impact palletizer capabilities. Film dispensing is based on load size and load position. Higher film pre-stretch is achieved with improved reliability and load containment. Stretch wrapping technology automatically recovers from film break without interruption or operator intervention. Keep up on our evolving product features and technology. Enter your e-mail and subscribe to our newsletter.